More than 200 bills received Maryland Gov. Larry Hogan's signature, including a fracking ban and other environmental measures — as well as protections from tax fraud and identity theft. ANNAPOLIS, Md. — Gov. 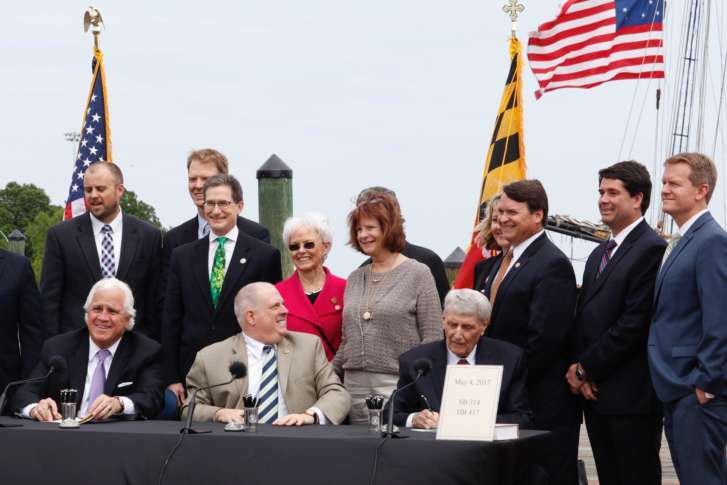 Larry Hogan signed over 200 bills Thursday at the state capital’s City Dock, and the occasion was marked with bipartisan moments. With the Pride of Baltimore (a replica of a Baltimore Clipper ship) in the background, Hogan sat with House Speaker Michael Busch and Senate President Mike Miller to sign 12 of the 207 bills at the dock. That site was selected because many of the bills signed are geared toward protecting the state’s environment. Among them: bills expanding a program that gives tax credits to buyers of certain electric cars. He added that the bills won’t crimp businesses either, citing things such as the tax credits for businesses that install electric car-charging stations. 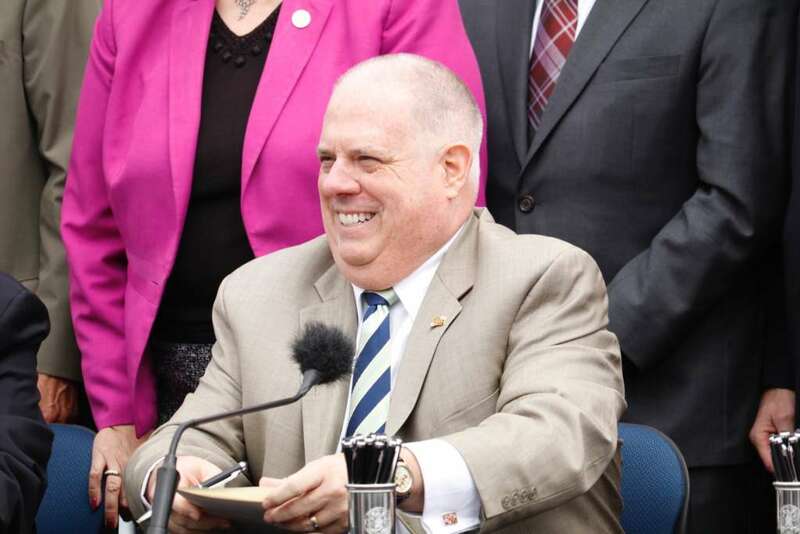 The legislation was the product of bipartisanship, Hogan said. “We all came together and passed some great bills to help grow clean energy investment and jobs in our state and to fully fund the Chesapeake Bay restoration program,” he said. The 2017 legislative session was “very big,” Senate President Mike Miller said. “There were a lot of very important things to be done,” he said, including a fracking ban. The senate president also echoed Hogan’s sentiments on the bipartisan nature of the legislation. Also receiving the governor’s signature Thursday was a measure creating greater protections from tax fraud and identity theft. The measure strengthens the ability of the comptroller’s office to stop tax fraud, protect taxpayer information and hold fraudulent filers and tax preparers accountable. “It’s the missing piece of the puzzle for fighting tax fraud,” Comptroller Peter Franchot said. The bill gives added responsibilities to the field enforcement division of the comptroller’s office to investigate potential tax fraud. It also allows the agency to seek injunctions against tax preparers suspected of fraudulent and criminal practices. According to the comptroller’s office, more than 76,000 fraudulent returns have been blocked from being processed since 2007, adding up to more than $174 million. One bill not signed Thursday is the paid sick leave bill, which requires businesses with 15 or more employees to provide five paid sick days. That bill is still under review, said Shareese Churchill, Hogan’s press secretary. The governor has until the end of May to sign or veto it. Otherwise it would go into law without his signature.